Shards of a mirror reflect body parts of unfamiliar people. Parts of others become part of one’s own face – how much of myself belongs to me? 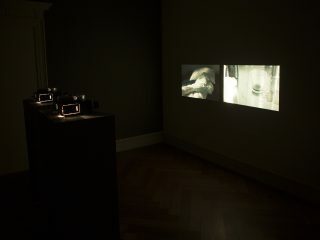 The video installation “Fragments of a Mirror” consists of four monitors each showing a single person. Each person runs a mirror fragment over their face. The respective body parts of the other people, who are likewise part of the installation, are reflected in the fragment. The videos run in an endless loop and each person is reflected once in each of them. Bernhard Kreutzer was born in Munich in 1986. His academic career began in 2007. 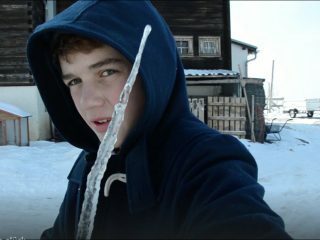 He has been studying in the Feature and Television Film department at the University of Television and Film Munich since 2010. In 2015, he was one of the award winners in the “Art for Art Trailer” competition hosted by Arbeitsgemeinschaft Deutscher Kunstvereine. Anne Pfeifer was born in Lindenfels 1987. She studied Visual Communication in Pforzheim (2008-2012) and Liberal Arts at the AdBK Munich (2014-2017) where she was a master-student of Prof. Jorinde Voigt. Just recently she was awarded with the scholarship “Young Art” of the city of Lemgo.